By 1901, dime museums had existed in NYC for about 60 years, starting with P.T. Barnum’s American Museum, which opened in 1842 and was wildly successful until it burned down in 1865. It was rebuilt and burned again in 1868, and P.T. Barnum threw up his hands and went into circuses and politics. So, circuses, basically. 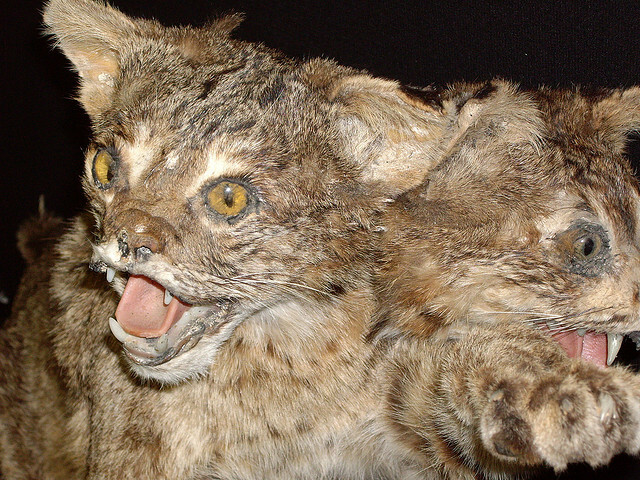 The American Museum was a combined zoo, museum, lecture hall, wax museum, freak show and theater. The famous Siamese twins, Chang and Eng, were featured there. 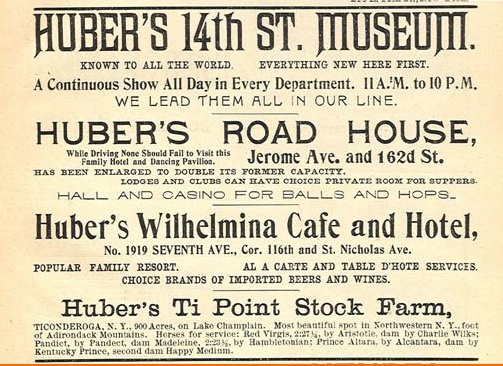 Huber’s 14th Street Museum opened around 1890 (accounts vary) and offered a similar array of entertainment. This short article about the closing of Huber’s in 1910 (to make way for a restaurant) gives a good sense of what the museum was like in its heyday. 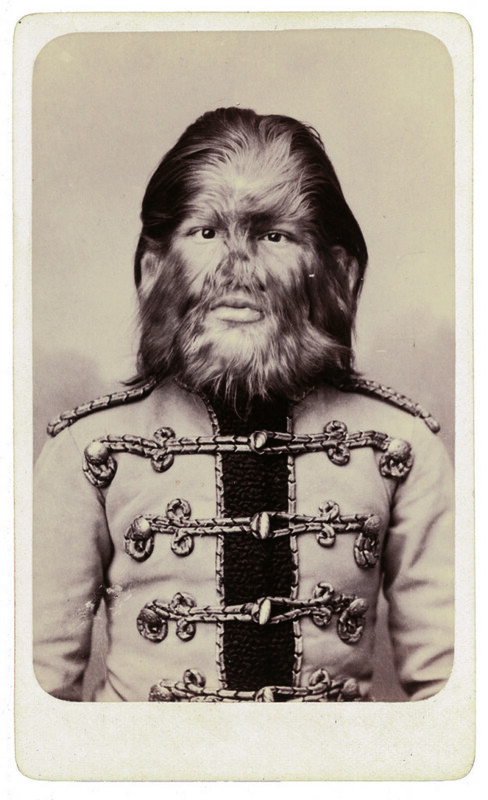 There were a huge variety of human anomalies being displayed at dime museums and sideshows during this time. Lesser forms of freak included the Circassian beauty mentioned in the story, who was basically a pretty girl with frizzy hair. “Leopard people” were black people with the skin condition vitiligo. People who might more legitimately be considered anomalous did, of course, have extra parts, missing parts, odd parts, unusual hair growth, non-standard shapes and sizes, etc. Being displayed in dime museums and sideshows afforded many of these people a degree of autonomy they would not have otherwise had, and seems preferable to being institutionalized or completely marginalized. Confusing for research purposes, there was a completely different dime museum/freak show called Hubert‘s which was near Times Square and lasted from the 1920s until 1965. Hubert’s was where Diane Arbus found the subjects for some of her photographs. 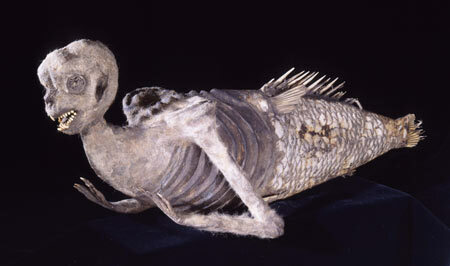 The “feejee” mermaid Martin is so keenly interested in seeing is a real thing. It is disappointing if you actually want to see a MERMAID. It is just gross and sad. And if that isn’t enough for you, here are more gruesome and disappointing mermaids. Feejee mermaids, along with jackalopes and other composite creatures, including the demon children mentioned in the book, are known as gaffs, and there is a brisk trade online in vintage and new gaffs of varying quality. Oh, cool! Do you recall if it was a specific episode? 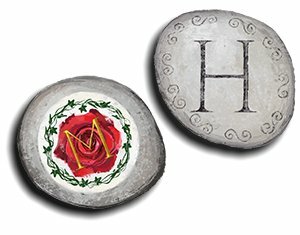 I watched the first few eps, and it was certainly interesting to me because of the time and place. I could definitely give it another chance for even a recreated Huber’s!